"What is a classifier and how is it different from a handshape?" The handshape of a sign is literally the shape (or shapes) in which we form our hand during the production of a sign. All signs have a handshape. Now don't go arguing about how "shaking your head" can mean "no" or a body shift can mean "or." I'm not talking about non-manual behaviors here -- I'm talking about signs. Is nodding your head "yes" a sign? No. It is a non-manual marker. Classifiers are signs that use handshapes that are associated with specific categories (classes) of size, shape, or usage. The commonly recognized handshapes that are typically used to show different classes of things, shapes, and sizes are called "classifiers." Classifiers can help to clarify your message, highlight specific details, and provide an efficient way of conveying information. * describe the size and shape of an object. * represent the object itself. * demonstrate how the object moves. * convey how it relates to other objects and or people. Similar to pronouns, that which is being represented (or described) by a classifier must be "introduced" prior to using using the classifier. If I'm going to use a classifier to to talk about Jane, first I'll identify her in some way. (If she is in the room I might point at her. If she is not in the room I might spell her name or point to where she usually sits.) Suppose I want to tell you that my sister "bumped into" her old boyfriend yesterday? I might start by signing "MY SISTER" with raised eyebrows to see if you recall my sister. Then after you nod slightly or otherwise indicate that you know who I'm talking about I might sign, YESTERDAY SHE M-A-L-L CL-1 "walking along, bumped-into" CL-1 FORMER BOYFRIEND. If I'm talking about throwing a baseball, I'll identify the sport before using a CL-3-claw to represent the ball. Classifiers tend to mimic the general shape and movement of the objects to which they refer. Suppose I were using a CL-O-flat handshape to represent (the head of) a dinosaur. I would bob the "head" a bit up and down as I moved it forward to represent how the dinosaur was moving. If using that same or a similar handshape (perhaps a slightly curved hand) for a cobra, I would move my arm in such a way as to mimic the cobra's side-to-side dance (or it's strike). Classifiers often work well with other classifiers to provide specific details about a situation, event, person, or thing. For example, if you want to describe a couch, you can use the sign for COUCH which is done by signing SIT then using moving both palm-down C-hands outward. If you wanted to make the point that the couch was lumpy you could then move your "C" hands in an up and down wavy manner as you move them to the outside. Or if you wanted to describe the couch as being very long or being in an L-shape you can move your "C" hands further apart or in an "L"-movement path. Classifiers help to paint a more precise picture of what your object looks like or of what happened. For example, suppose there was a car crash, what happened to the car? Did the other driver hit you from the side, the front? What happened to you? Did you hit your head on the steering wheel or fly through the window? CL-G- thin things (or degree of thinness), also "eyelids"
CL-R Rope-like, braided, rolled,and/or twisted things. CL-V (bent fingers) = a small animal, or a larger animal sitting. CL-Y Very wide things. A fat person walking. A hippopotamus's mouth. * Vehicle locations: "A car was here." "There was a car in this location facing or moving in this direction." * People standing in line. The movement of lines of people. Example of a sentence mixing a regular sign and a classifier: I went to stand in line and then noticed that the line was extremely long! * Upright objects viewed while traveling very fast: commonly used to describe blurred scenery while driving very fast. * Transitory handshape involved with spreading outward. * An object in a specified location: a house on a street, a statue or vase on a table, a lamp on a desk. * An object or person that commutes: A person going to the bathroom repeatedly, a person going to work repeatedly, a ski-lift, a ferry. Example of a sentence mixing a regular sign and a classifier: The clown had a really big nose. Example of a sentence mixing a regular sign and a classifier: My friend was walking past my parrot and my parrot bit him on the shoulder! * The use, movement, or placement of small, thin, round objects: button, coin, polka dots, pepperoni, pepper shaker, chain links, rings: ear, nose etc., a single drop of rain, a single snowflake. * manipulation or holding of very thin things or small things: flossing, threading a needle, turning a page, pulling out a hair. Looks like an "F" handshape but the index and thumb are separated. * Good for small, round, flat things such as a cookie, or a gold coin (such as a "piece of 8" coin). * Diminishing into the distance / leaving: changes from a wide-G to a closed-G to show concept of "gone"
* Come into view suddenly: An object that was far away comes closer (thus appearing larger) by using a closed-G and expanding it into an index-thumb-C.
Can include versions of the "H" hand in which the thumb is slightly separated from the fingers and then closes onto them as if showing a clamping or attaching movement. Looks like an "H" hand but the thumb is sticking out to the side. * a tongue: "a dog licking a person's face"
* Two long, skinny objects spaced apart from each other: "splits in bowling"
* A person or animal that is crouched or hunched over (using a modified version of CL- 1): a person who skulks, slinks, shrinks or slouches. * A snake or frog tongue just before flicking outward from the mouth. * The holding and manipulation of something very small, very fine, or very thin such as a needle or a razor blade. Dr. Vicars: What is a classifier? What do you think Art? Art: I think you caught me not doing today's homework. Dr. Vicars: Heh, sorry, for putting you on the spot. Heather: It's the form of the fingers or hands to indicate a type of sign. Such as... if you want to sign a cup or a plate, you form either a small circle with the hands, or you form a larger circle with the hands. Tigie: Like long narrow things and round flat things? Daniel: Signs that represent classes of objects such as land or water vehicles as a group. Dr. Vicars: Those are some great answers, I think we are getting there. :) Now give me another example. Sandy: Like using the index finger to show long skinny things? Sandy: What I didn't understand in looking at this was - isn't it overly broad? Is it really understood? Dr. Vicars: Think of classifiers as a type of pronoun. You have to identify your pronoun before you can use it. Also you have to use it in context. I cant just start a conversation with you by signing, "HE WALK." I have to set up some sort of situation or context, then I spell F-R-E-D, and then point to the right then form the INDEX-finger-classifier (or "Classifier 1" also shown as CL-1) and move it to the left. Tigie: How do you know that classifier "F" isn't part of a fingerspelled or initialized word instead of representing a small round thing? Dr. Vicars: Great question. The answer is context. It is the same way you know the letter O and the number 0 (zero) are different. It depends where they show up and how they are used. Dr. Vicars: I don't expect you all to be experts at classifiers, just want you to know they exist. An example on that "F" concept: If I sign "I BUY NEW SHIRT" then I touch an F on my chest and throw it off suddenly it could mean: "and the button popped off." The "F" classifier acquired the meaning of "button" because of the context (I was talking about "shirts" and placement on my chest). Tigie: Would everyone understand that a button popped off and not for instance a bottle cap? Dr. Vicars: Remember this concept: "Show, don't tell." It is much faster to create an imaginary person or object then show what happens to it or him--than to describe every item in the situation. In the case of the bottle cap I would have had to indicate a bottle of some kind before using an f classifier. The only possible meaning for the classifier in the shirt example would be a button, because that was the context. People normally don't wear a row of bottle-caps down the front of their shirts. Sandy: So, classifiers are used later on in the "sentence," -- it makes more sense now. Heather: Why would you use the "F" sign to show a button popped off? Wouldn't you use a "B?" Dr. Vicars: Because the shape of the fingerspelled letter "F" has a round hole representing the shape of a button. A "B" would be used to represent things that are flat. Remember ASL is not linking to English it is linking to a concept. Heather: Thanks, that makes perfect sense. CL-1 Things that are (relatively) long and skinny. A pencil, a stick, a person. CL-A an object in a certain location. A house, a lamp. CL-Y Very wide things. A fat person walking (WADDLE). A hippopotamus's mouth. Below are some examples of "types" of classifiers. I don't expect you to get a handle on these just because I list them, but I thought you would enjoy seeing a sample the diversity of classifiers out there (there are many more than I'm indicating here). This list is from a study guide I hand out to my students at the college during certain semesters when I teach from the Vista, Signing Naturally curriculum (Lentz, Mikos, & Smith, 1988). Note: I've modified the list here and there and added some of my own information. • Descriptive Classifiers (DCL), are also known as size and shape specifiers, (SASSes). They describe a person or object. • Semantic Classifiers, represent categories of nouns. For example, people or vehicles. SCL-1 (person) "person walks to...____"
• Locative Classifiers, show placement or spatial information about an object. Sometimes indicate movement. LCL-C/LCL-B "place cup on napkin"
LCL-5 "leaf floating to the ground"
LCL-1 (sticks) "one here-one here"
Indicating a specific number or a non-specific number. PCL-4 "long line of people"
PCL-4 "people moving in line"
PCL- 5 "hordes of _____." Often called "scads of." PCL-V "people seated in a circle"
• Instrument Classifiers, you use your hands (or an other part of your body) to manipulate an "object." ICL "hammer in a nail"
ICL (garbage) ICL "dump out"
ICL (wash-clothes) ICL "hang up"
You use your body to "act out" or "role play." Sometimes this is like "mime." Other times you just show the action (or interaction) that is going on. Often this involves "role shifting." A specific part of your body is doing an action. BPCL (head) "head tilted back"
Student: I don't get what it means in the outline where it says: SCL-1 (person) "walking fast"
Dr. Vicars: Oh okay then... let me clarify that. The SCL simply identifies the general category. The ":" means what a normal colon means. The "1" represents making a "one" handshape with you index finger. The ( ) tells you what it is representing--you have to pre-identify this in your sentence or conversation. The manner or how it was done is in the "quotes"
So if I wanted to show "Bob" walking fast, I would fingerspell his name, then hold up that finger and move it quickly across my signing space. That would be a classifier indicating how he is moving. I have a question for you, can you give me a definition for "Classifier Predicates"? 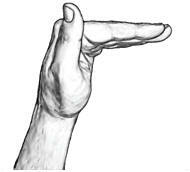 A classifier (in ASL) is a sign that represents a general category of things, shapes, or sizes. The topic is “John” the predicate is an “adjective predicate” describing John’s appearance. The topic is “John” the predicate is a “verb predicate” stating what John did or is doing. The topic is “John” the predicate is a “noun predicate” stating John’s location. The topic is “John” the predicate is a “classifier predicate” indicating that John quickly looked to his right. Element classifiers: Describe things that do not have specific shapes or sizes, and are usually in constant motion. ECL-1 (zig zag) "a flash of lightning"
ECL-flat O----->spread C "twinkling lights"
Lentz, E. M., Mikos, K., Smith, C., & Dawn Sign Press. (1988). Signing naturally teacher's curriculum guide. San Diego, CA: DawnSign Press. Valli, C. & Lucas, C. (2000). Linguistics of American Sign Language. (3rd ed.). Washington, DC: Gallaudet University Press. CL- 3 "car weaving on the road"
CL- 5 "leaf drifting to the ground"
CL- X>1"projectile soaring through air"
CL- 55 "wind blowing in one direction"
CL- S "deliver vertical item to"
CL- CLAW>S "catch a small item"
CL- bent-V "person sitting facing me"
CL- O>5: "spill or spread"
CL- C "cup hand to or move to"
CL- V/B "jump off edge"
CL- 4/1 "water running out of a faucet"
CL- S>loose-5 "water spewed out of mouth"
CL- bent-V "people sitting in a semi-circle"
CL- O>5 "water balloon splatting onto side of head"
OWN opinions regarding various classifiers and your opinion will help inform and further develop the topic. And you might actually come up with new "classifications of classifiers." Or you might come up with "sub-categories" of classifiers. For example, my wife, Belinda Vicars, came up with the phrase: "Trajectory Classifiers" (such as "projectiles") which show the movement path, distance, and speed of objects. Such classifiers are perhaps best considered a subset of "locatives." Is "Trajectory Classifiers" an original term? I "think so" but then again there are thousands of people out there thinking about, developing, and writing about the structure and usage of signs. That only bolsters my point: If you are active in the Deaf community and/or if you use ASL regularly with native Adult signers I encourage you to note your observations, think about them, and share those observations in an organized manner with others. You asked: "...and then claw C over the ears. Ear muffs or headphones?" Answer: It could be either depending on the context. Classifiers function to some extent as "pronouns" and must typically first be identified. For example "MY SON BOUGHT NEW I-P-A-D. NOW HE WANT CL-C: "headphones." (Or, more likely CL-G: "earbuds"). The clown had a really big nose. Example of a sentence mixing a regular sign and a classifier: My friend was walking past my parrot … and my parrot bit him on the shoulder!